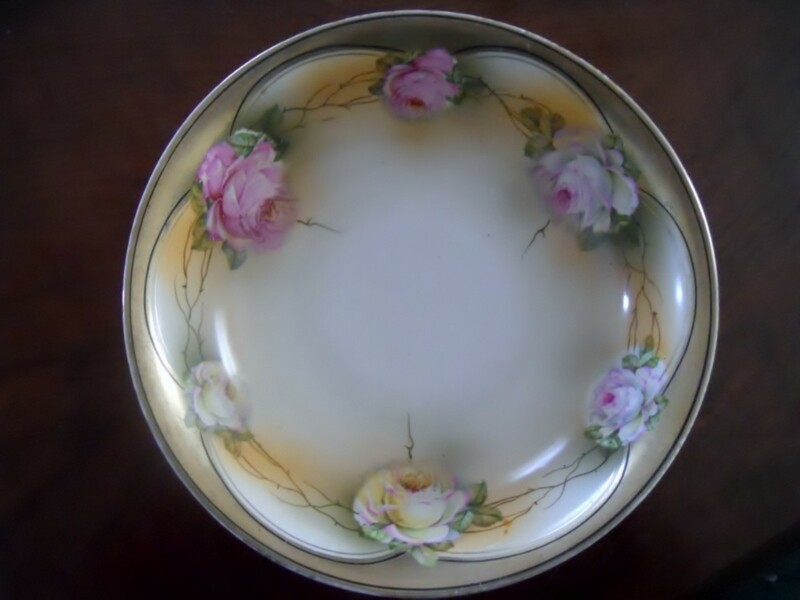 Whether you decide to start a porcelain collection or want to identify your existing vintage and antique pieces or shop auctions for additions to your collection, you will find valuable information here on identifying antique and vintage pieces. I started selling collectibles online a while back. The host website guidelines required that I fully describe anything I sell. 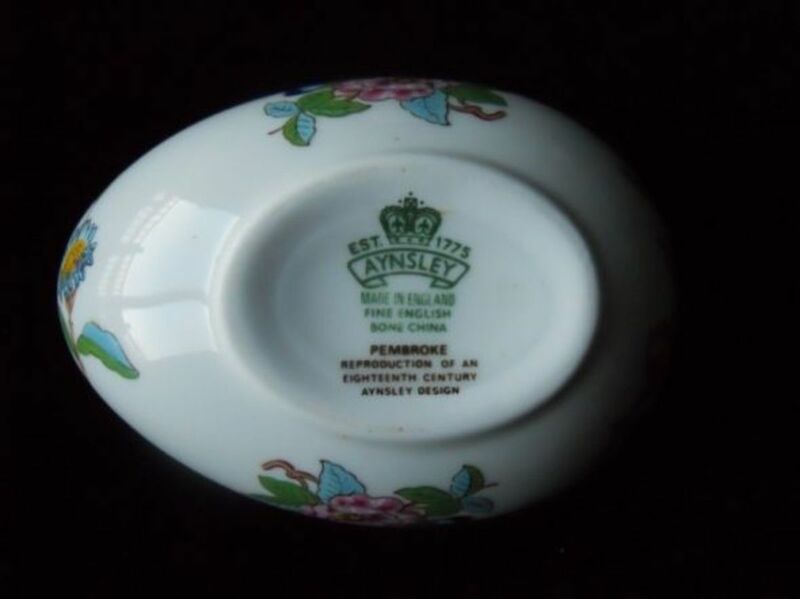 In doing my research for the items I was selling, I found fascinating information on identifying porcelain by its mark. 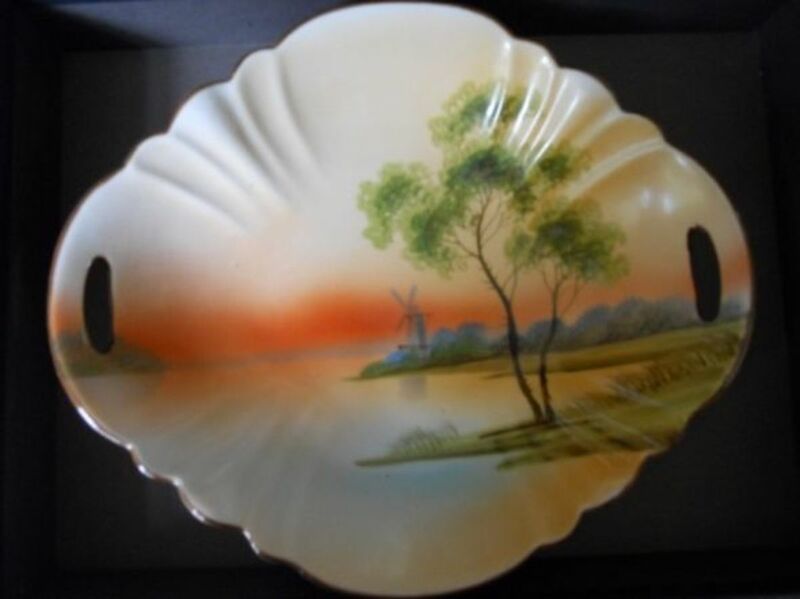 The more you discover about vintage porcelain, the more interesting it is. Even if you do not want to get into collecting, looking at the pretty pieces is enjoyable and relaxing. My collection is mostly inherited. The family pieces of that I have have memories attached to them. When porcelain is held to the light it is translucent. Pottery is opaque. It is stronger than pottery. 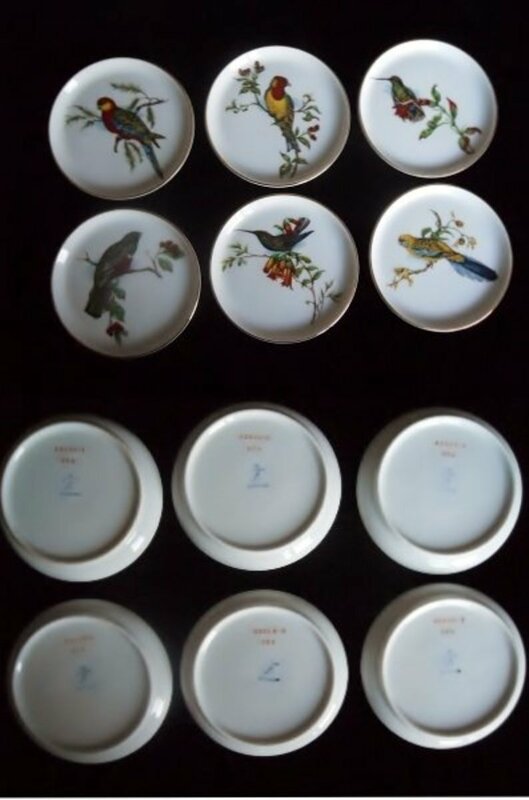 Do you have a porcelain collection? 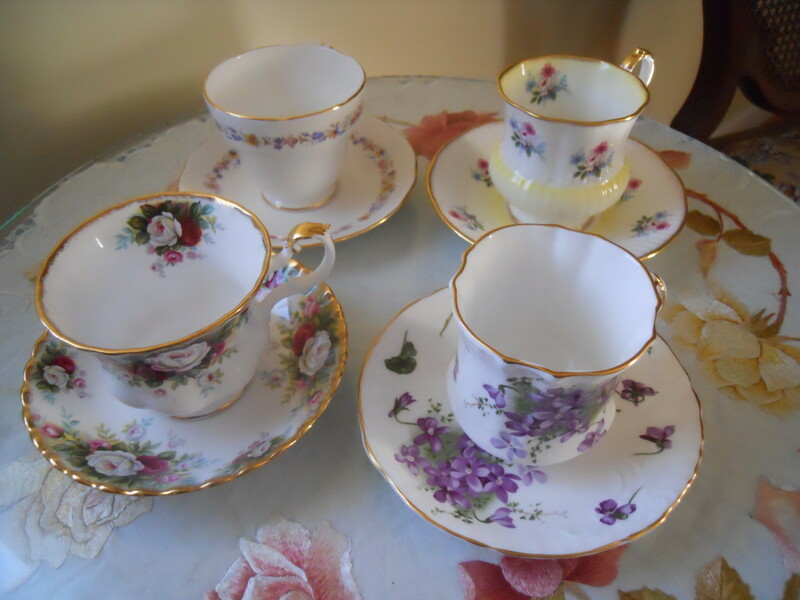 You could collect everything by one manufacturer -- all Royal Worcester or Spode. You could collect figurines from different manufacturers of one item --- cats, roses, violets. Another idea is to collect all of one thing: snuff boxes, hatpin holders, pitchers, etc. All quality porcelain has a mark (sometimes called a pottery mark or hallmark). Identifying the manufacturer associated with this mark is key in determining the age and value of your piece. You may even get some history about its origins. This is one of a pair of compote dishes that I own. There is a base which screws on and off of this plate. 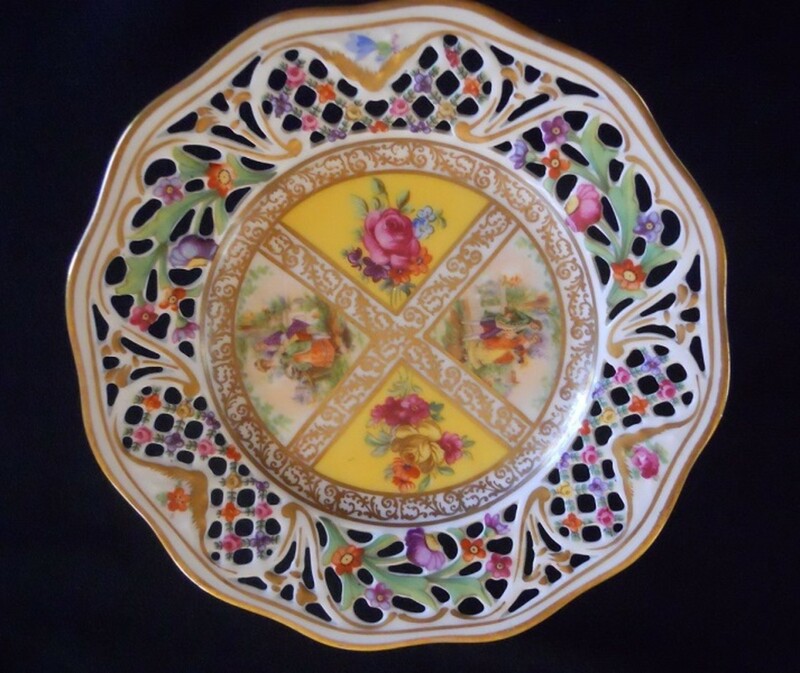 This is the Royal Dresdner pattern with a scalloped edge pierced rim. It was made by Porzellanfabrik Carl Schumann A.G. a factory which existed using this name from 1923 - 1994). 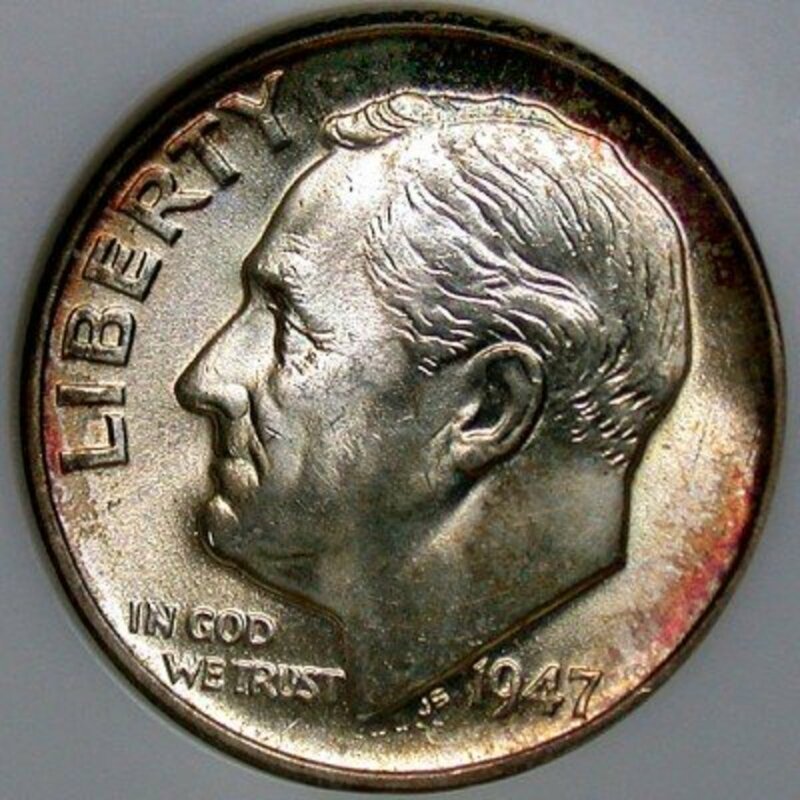 The mark on the bottom was used from 1923 to 1948. This Royal Dresdner blue pottery mark is a little hard to read as it is inside the pedestal of the compote dish shown above and thus, not on a flat surface. 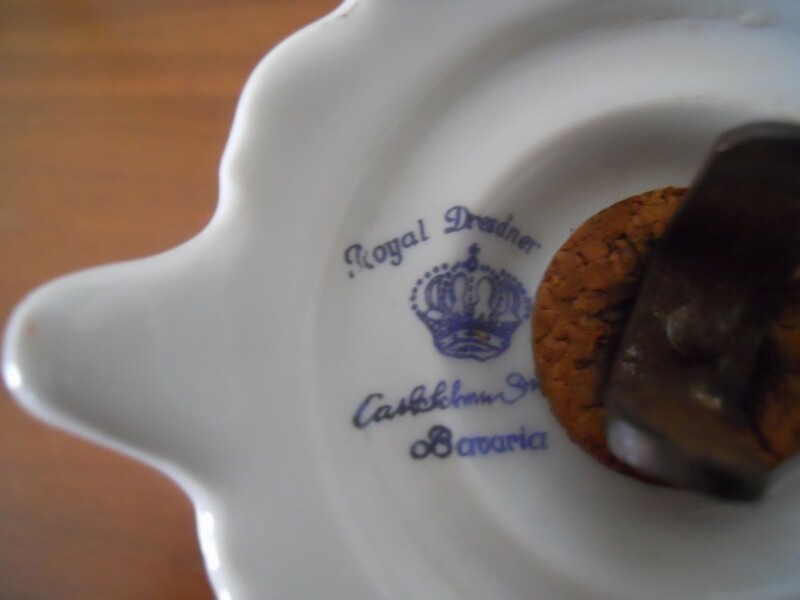 It says "Royal Dresdener" "Carl Schuman" "Bavaria" with and image of a crown. What you are also looking at is the butterfly nut that unscrews the pedestal from the flat top plate. This bowl has been in our family for quite some time. It was my grandmother's. There is limited information on Leuchtenburg. It appears they were at one time either absorbed by, or a division of Lehmann & Sohn (Lehmann & Son). There is information on the internet, but it is in German. My German is sparse. There is not much information on the green Leuchtenburg mark. 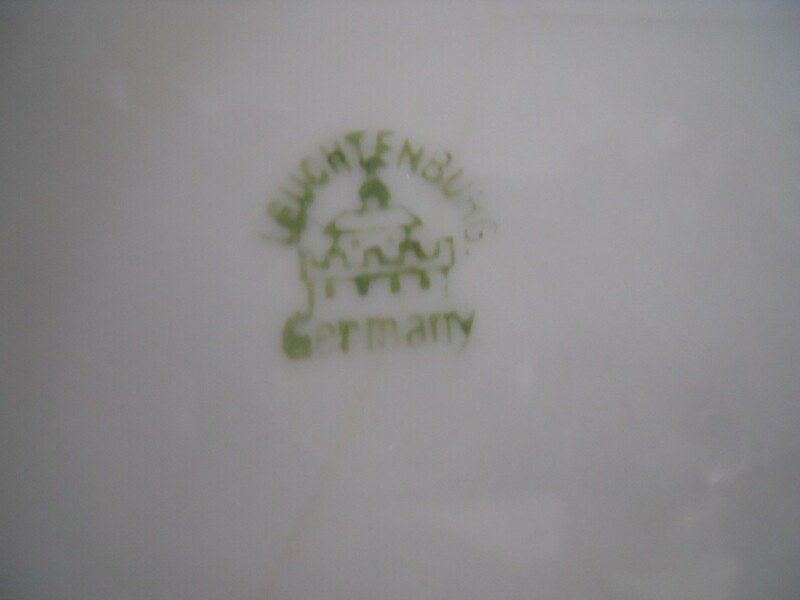 It says "Leuchtenberg" "Germany". We can often date the piece by which version of the mark is being used. 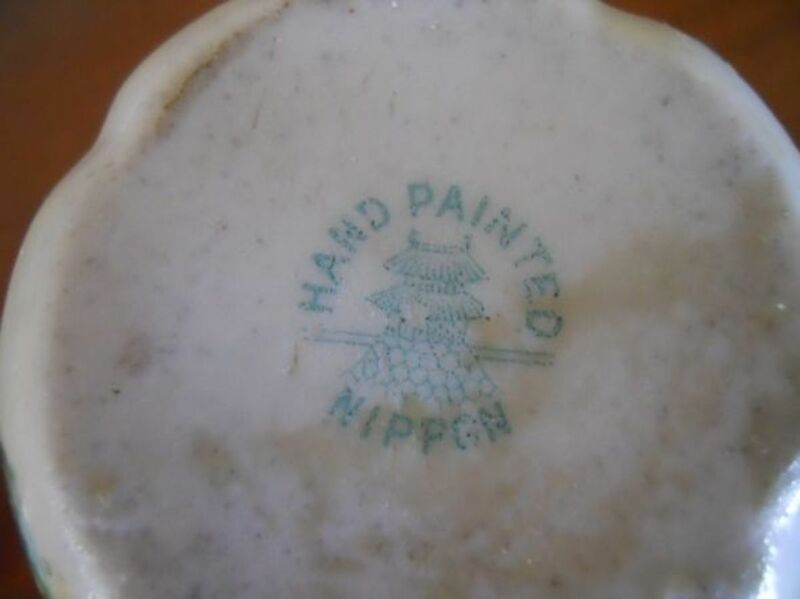 Japanese products were marked "Nippon" from 1891 to 1921. "Nippon" refers only to the Japanese way of saying "Japan". It merely indicated that it was made in Japan. 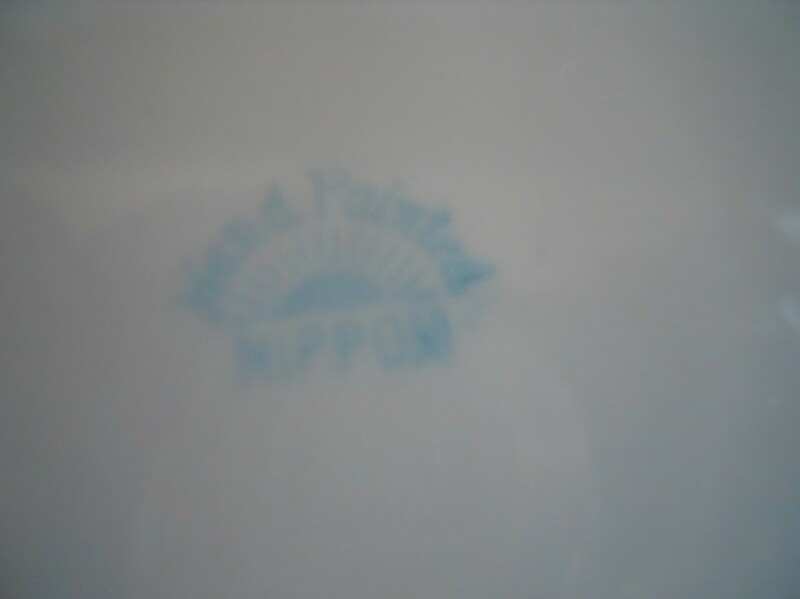 There are many different manufacturers who marked their china "Nippon". The quality and value varies from manufacturer to manufacturer. 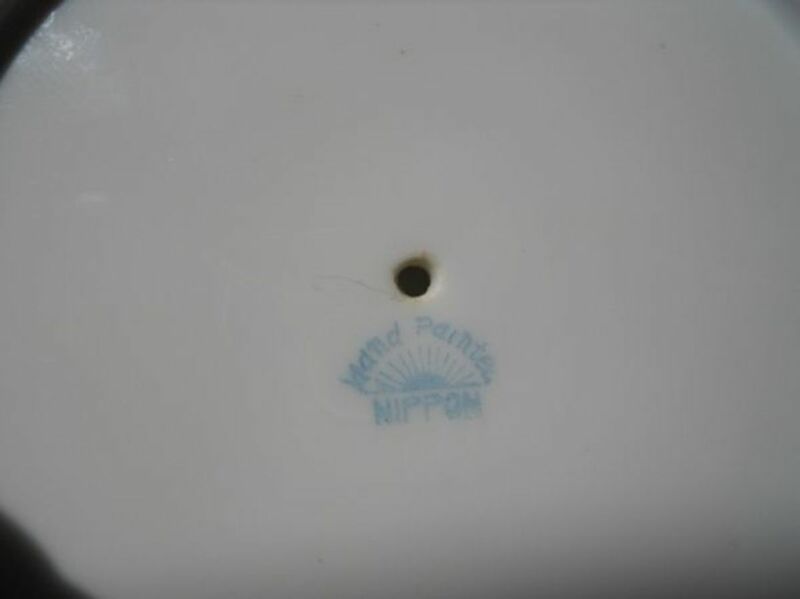 To determine more about Japanese porcelain in the Nippon period you need to check the manufacturer marks. 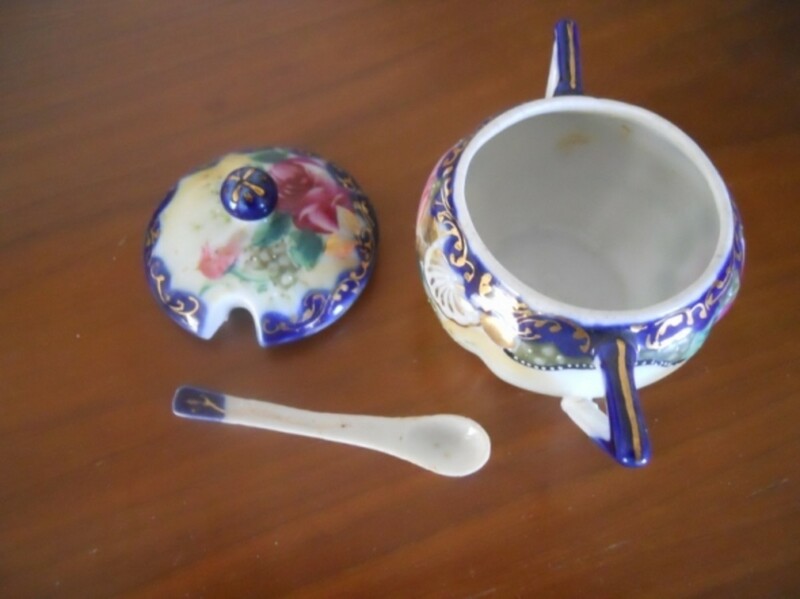 There are many Japanese porcelain manufacturers and thus many porcelain marks. 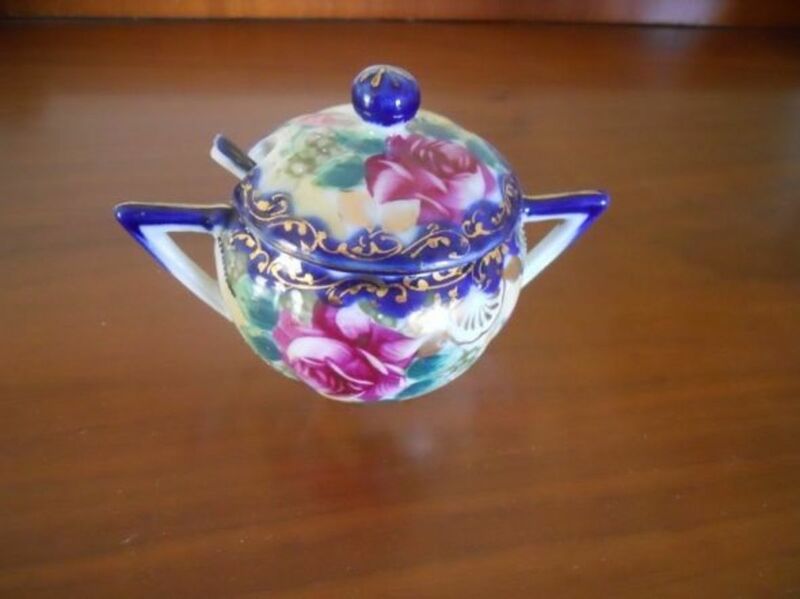 Another Example Of Nippon Era Porcelain - This reminds me of an arts & crafts period type of design. Remember to verify the pottery mark. There are a lot of forgeries on the market. Many forgeries are made in China and are very good copies. Some of the sellers are actually unsuspecting, and are not aware they are selling a forgery; some are not. 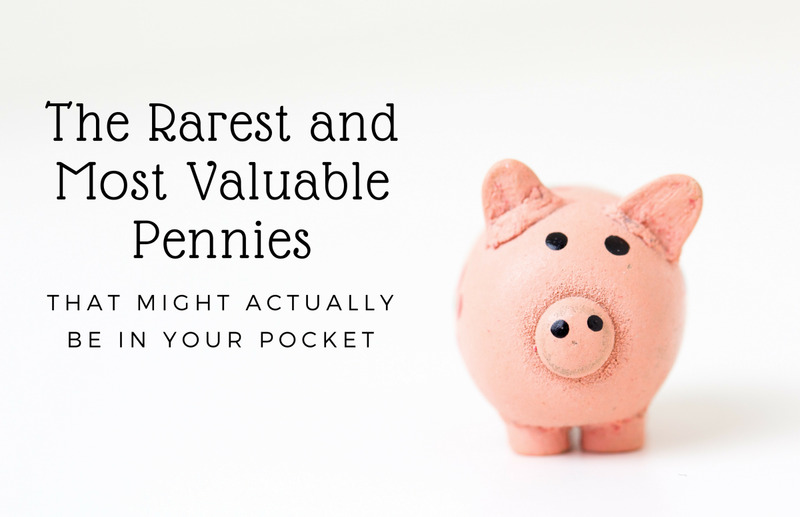 Before you plunk down a lot of money for any piece, do some research. Looking at similar items on the auction sites is another way to verify you are in the right price range when you bid. Do not base that estimate on the asking price. Some of those are over priced and will either never sell or take a long time -- until an uninformed person comes along. Filter the pages by the auctions that are closing soonest, and look at the pieces people are bidding on and what they are bidding toward the end of the sale. The Charles Sadek Company is still operating. The image of the Sadek "Y" mark in the upper left hand corner. The number is the design number. Even some pieces that are worn are valuable if the wear is not unusual for its age. Of course, an older piece in excellent or mint condition is worth more than one that is worn. The level of detail in a particular piece. A simple vase may be worth less than an intricate figurine made by the same manufacturer. Look at the different Royal Bayreuth items. Scarcity or uniqueness. If for example it was a commissioned piece and there was only one made, the value goes way up. If the pattern is discontinued the may be less of those pieces available. Having all the pieces of a set, for example both candle holders and matching bowl, or the whole vanity set. A history. It was commissioned by someone famous or for a famous event, such as a coronation or anniversary. How much do you enjoy the piece or what does it mean to you? Does it give you pleasure to look at? Did it belong to a beloved relative? Did you receive from someone special for a special occasion? Value is not always monetary. The mark was used by Sontag & Maisel between 1882 - 1902. 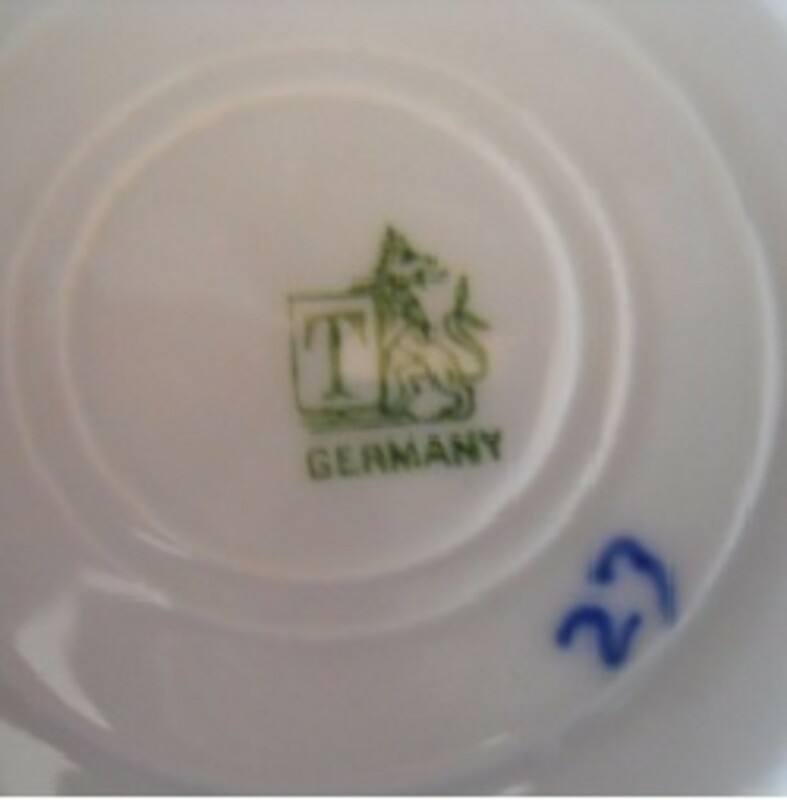 The large "T" stands for Tettau, a municipality in Bavaria, West Germany known for it's many porcelain manufacturers. Do not place your fine porcelain in the metal plate holders with springs that hang on the wall. The metal edges scratch the fine porcelain. The spring action can also snap, cracking the plate. Made by Furstenberg, Germany. Furstenberg has been in business since 1747. These coasters are from the late 1970s - early 1980s. The coasters are numbered on back 02649; 1 through 6. Each coaster has a 3-7/8 inch diameter. The Porcelain Moschendorf Factory, Bavaria, Germany was in operation from c. 1904 - 1938. It is marked [green backstamp, PM with wreath and royal crown] This mark was used between 1895 and 1910. Interesting story about this bowl. My Mom had six small dessert dishes that matched this bowl. They were given to her by her great Aunt. 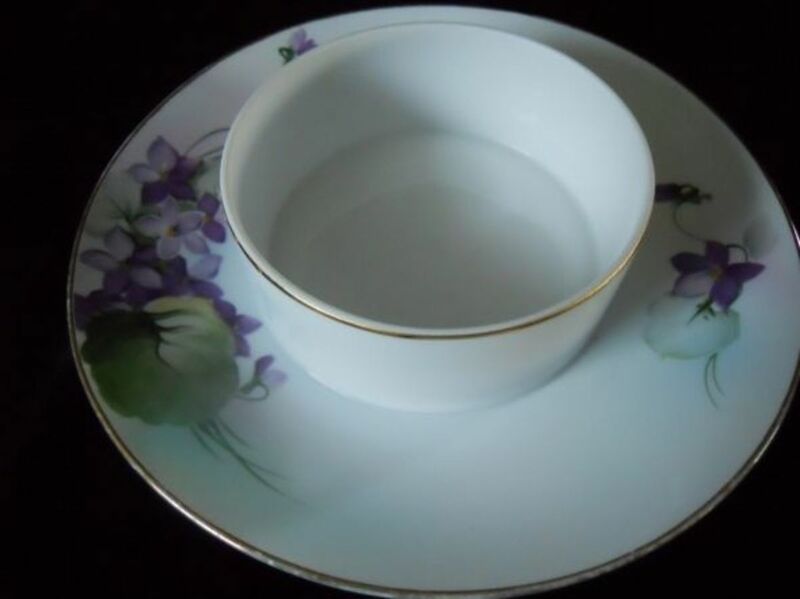 Whenever my Mom served dessert in these dishes, she would always says "it's a shame Tante broke the big dish. 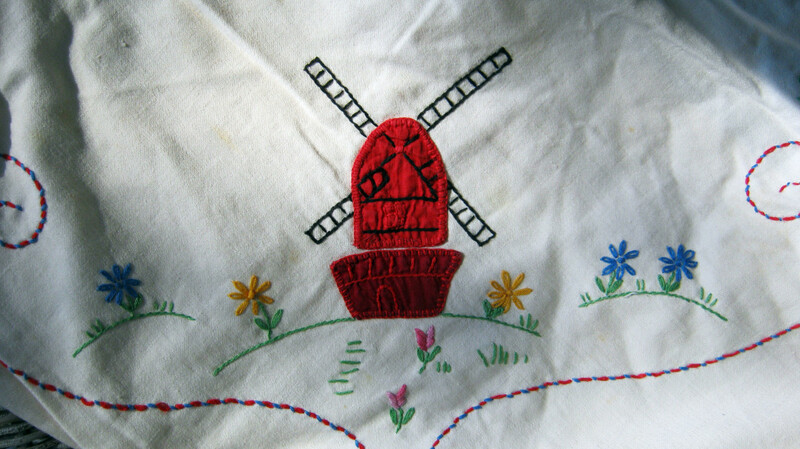 Tante used to make Rote Grutze in the big bowl and dish it out in the little dishes." My Mom and her great Aunt live in New York. One day I was wandering through a flea market in Connecticut and there was the large bowl. My Mom was so surprised when she opened her Mother's Day Gift and found this bowl. 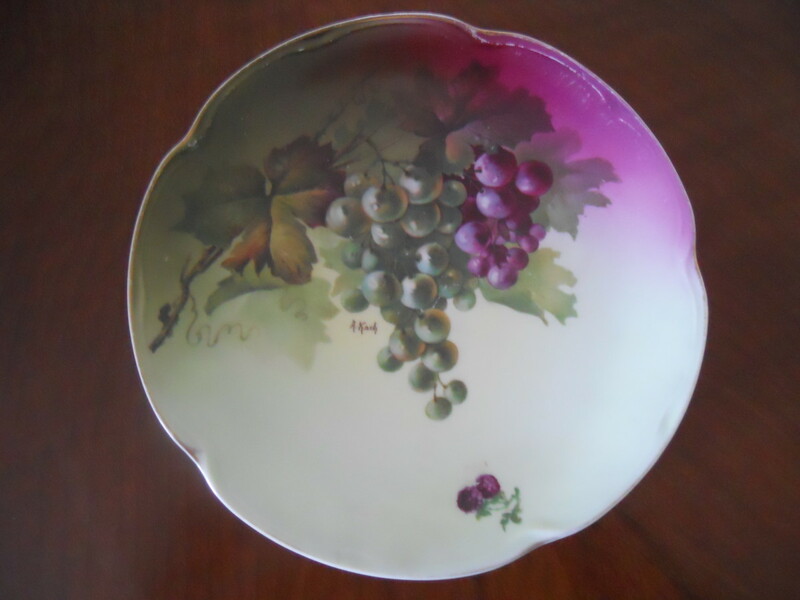 Do not wash your vintage porcelain in the dishwasher. These dessert dishes used to match the above bowl. Older pigments, paints and gilding were not made dishwasher safe. Compare these dishes that were washed in the dishwasher to the bowl above. See how the iridescent border has faded. Please sign in and let me know you were here. If it's Nippon it should say "Nippon" on it. I don't believe there is the capability of uploading pictures to an article. This is not a forum. I have what I believe to be a Nippon hand painted mustard jar. It has a green makers mark with an M inside a wreath. Any and all thoughts are welcome... On a side bar, I am new to the group and would like to know if and how one can up-load pics. Wow! An awesome collection. I too have some nice porcelain collection. An interesting lens. Such a beautiful collection. Wonderful lens. What a beautiful collection of porcelain... Thanks a lot for sharing this beautiful lens!!! Again, very useful information and beautiful pictures. Pictures are always clear sharp and showing details important to the piece. Not just a seller, but a knowledgeable collector. Sheer smoothness of porcelain and the artful floral decoration is very enticing. I really, really like porcelain pieces -- but only to admire them, never to own them! I wouldn't like to be so careful around them, no way! Wow, so many beautiful items with pretty details, I just love looking at your pictures, though I am nervous around glass...it is so fragile, and I'm afraid of breaking it. What an amazing collection. woooowwww....beautiful collection. I will buy some set. thank for sharing. Some great ideas for adding to my Mum's collection as a Mothers Day Gift. My wife would love the hummingbird coasters. Nice collection of porcelain. I would be so scared to even be around that stuff. Kind of a bull in a china shop ya know? Beautiful lens, thankyou for sharing your collection. I love vintage and porcelain. Beautiful collection. Beautiful porcelain pieces! This lens is stunning from start to finish. Beuatiful collection, thank you for sharing. It's hard to find quality and detail in today's porcelain at your local store so I am very glad that you have showcased a few places where we could find it. wow! those Pembroke Porcelain Eggs are exquisite...congratulations on LOTD - well deserved! 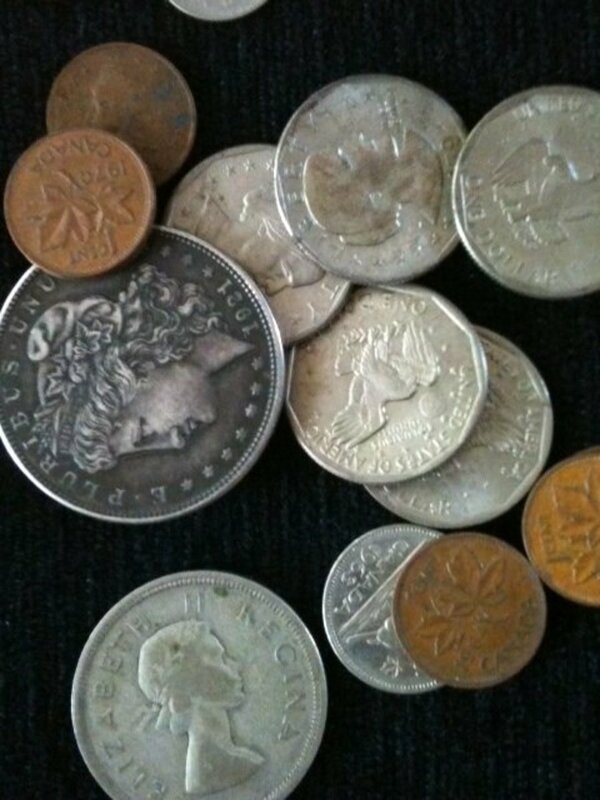 Thank you for sharing your beautiful collection on Squidoo. Very insteresting! 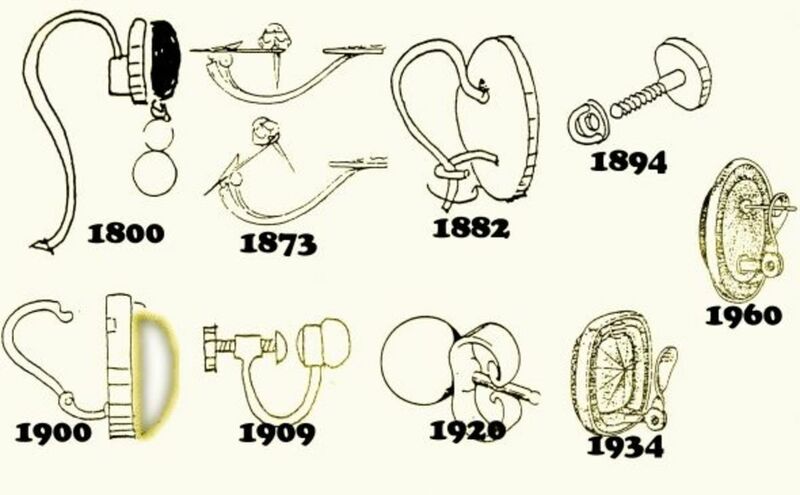 I didn't know that there are so many things to know about porcelain. Superb collection and great information on porcelain. Congratulations on getting LotD and the Purple Star! What a fabulous collection. I was oh-ing and ah-ing all the way through. What beauty to behold!!! Congrats on purple star and lens of the day. I collect porcelain figurines primarily from Germany. Your collection is stunning. Terrific lens. Congrats - Great lens! The wife and I enjoy finding Pixieware...yes, a bit kitschy but fun all the same. Very nice lens - it was calming to read just thinking about pretty things! I have a cup and saucer collection of which some are porcelain. I enjoyed reading your lens. I have some pieces from my Grandmother, and now I have more information about them. Your writing has inspired me to get them out and research their origins. I love the great pictures you included. My dad had some nice pieces of porcelain...most of them were given away by my mom who didn't care much for them. Wish we'd saved them and started a collection instead. These are just magnificent and as usual a great lens so congratulations on the LOTD you deserve it. Wow, some beautiful porcelain collection. Great job on LOTD! Congratulations on LOTD - some beautiful pieces - I love the Pembroke! Lovely lens...well done on LOTD and purple star! Congratulations on your LOTD. Thanks for the info and sharing photos, very nice. 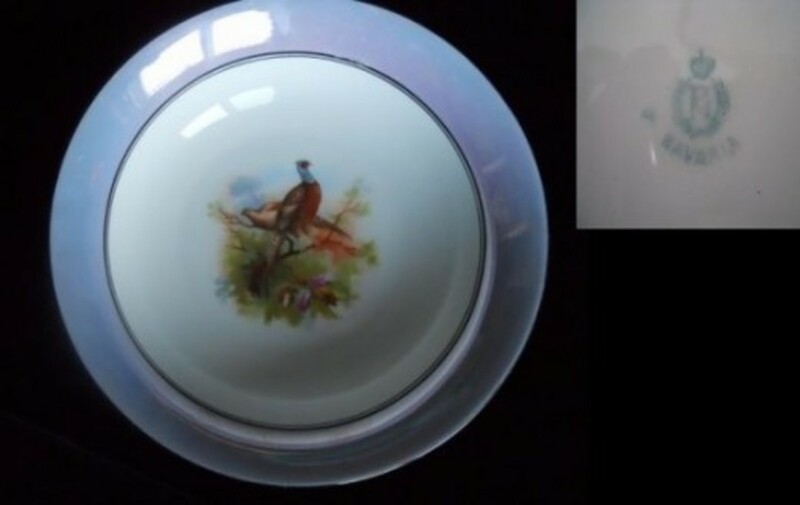 You have and have listed some Beautiful porcelain. Great, informative lens. Thank you. What a delight is was to browse through your porcelain collection with you and learning from someone who loves what they're doing is always special. 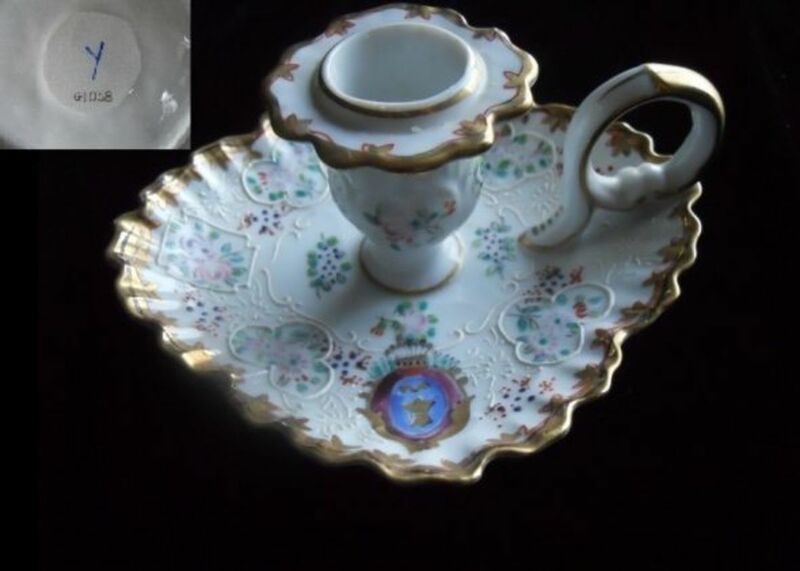 I especially liked what you had to say about "value" and I sure hope folks catch that tip to not use those metal holders or put vintage porcelain in the dishwasher, it makes sense that they could cause damage especially to the older and more fragile pieces. Very well presented with love in your heart, congratulations on LotD! 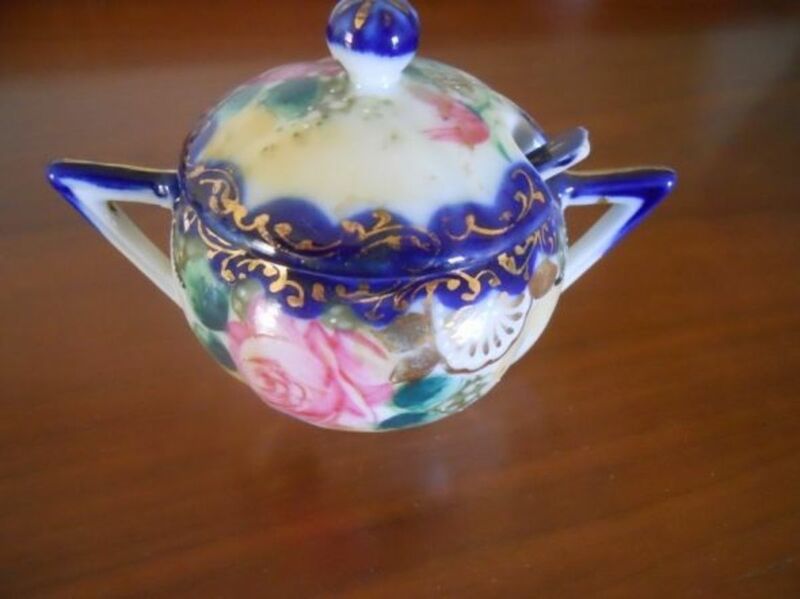 Oh those are really beautiful and super vintage looking Porcelain collectibles. Very interesting and well done lens! Makes me want to revisit with my porcelain pieces and pick up some more. On my business trips to Japan I was always amazed at the variety and beauty of all the porcelain I saw. Good lens! Wow! I never knew there were so may types of porcelain. I thought Chinese was the best, but that Japanese porcelain looks really pretty! Porcelain is very beautiful. Thanks for sharing some good tips on identifying quality porcelain. Well done and very informative. Thank you for an inviting lens. I love your lense, very well structured and yes full of useful info! Some of those pieces you presented are gorgeous! This is really great lens with loads of good info. I used to have a few pieces of Royal Doulton which I picked up at various flea markets in the UK, but unfortunately when I moved to Spain the removal truck had an accident and was left by the roadside overnight. A lot of my things were stolen from the truck, among which were my porcelain pieces. Very informative and well done lens! 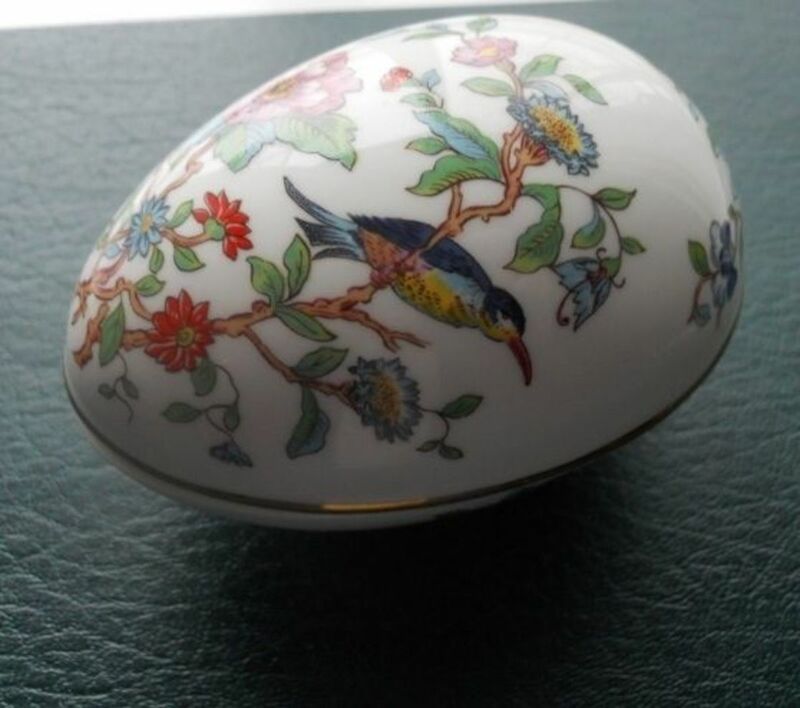 I've been "into" Danish porcelain and art pottery since my late 20's; my mom was also a collector, mostly of bird figurines although she also had some other beautiful items. For a while I was also co-owner of a store where we sold various European porcelains like Royal Copenhagen, Meissen, Lladro, Rosenthal, B&amp;G and others... it was a nice walk done memory lane to read this. Oh, and congrats on getting LOTD! Lots of great information! I learned a lot. Congrats on the LOTD! This lens was excellent and informative. There are still factories that make porcelain in Britain and Japan. Royal Doulton has a fine collection of figurines for example. The fine white china clay needed is still available but supply has been greatly diminished. Noritake were also still manufacturing in Japan. Britain, China and Japan were blessed with the best quality clays and therefore this is where most of the finer pieces were made. 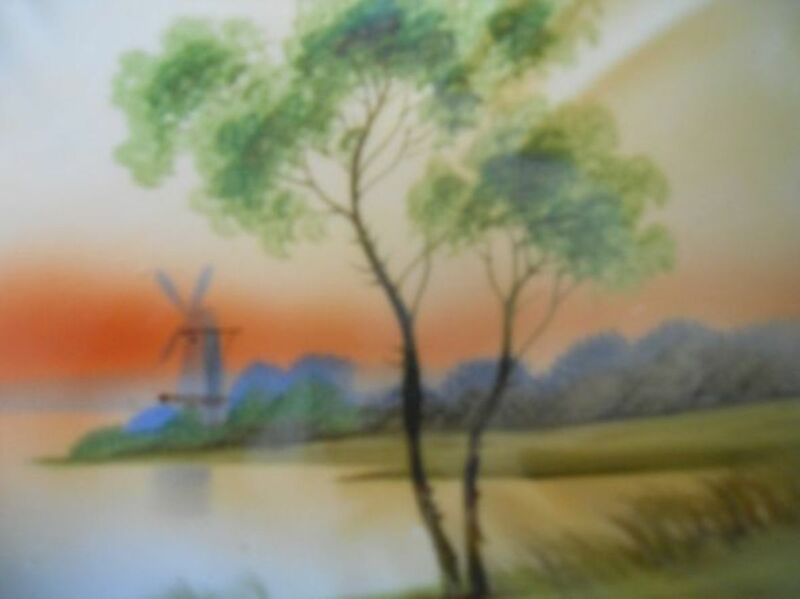 Dreseden in Germany and Royal Delft in Holland also made some fabulous pieces. What an excellent resource! I don't (didn't) know much about the ins and outs of collecting porcelain, but I know that I absolutely love to look at it. Your collection is beautiful! Congratulations on this well-deserved Lens of the Day! 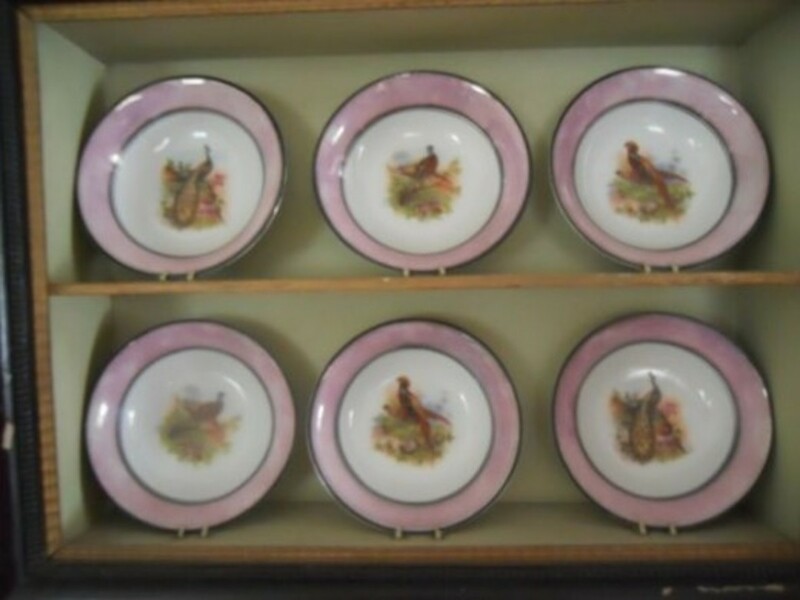 Thanks so much for sharing your vintage porcelain collection. These pieces are beautiful! BTW, Congratulations on LOTD! Thank you for sharing this remarkable lens "My Vintage Porcelain Collection" and Congrads on Lens of the Day !! Nice lens, my parents have a real nice collection. What a great collection and you've toke much time to collect all of beautiful porcelain pieces. I must say that the complete collection is beautiful. Congratulations on LOTD! A lady after my own heart...you'd love my house...soooo many plates! Congratulations on your LOTD! Well desrved. It's great to see a fellow Ruby Lane dealer on Squidoo. Good luck on Squidoo and Ruby Lane. Blessed. Beautiful! Absolutely gorgeous! Thanks so much for this interesting and educational lens - as well as for treating us to some truly lovely examples. Congratulations on you LOTD honors! I loved this page! Blessed! Awesome lens, and an awesome collection! This kind of porcelain deserves the appreciation you are giving it here! And congratulations on LOTD, too! Congratulations on a well deserved LOTD. I sure enjoyed my visit and now will spend the day looking through our Porcelain. We have some very old pieces that I need to find out more about. 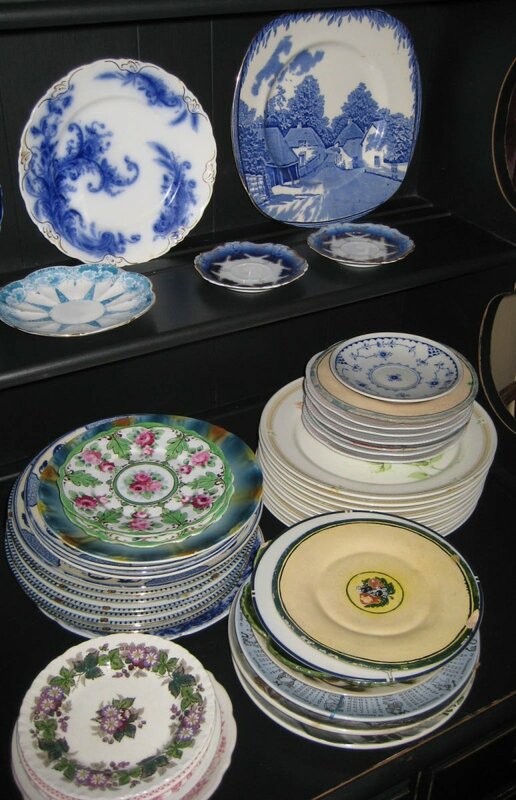 Thanks for all this great info and for sharing your Vintage Porcelain Collection. 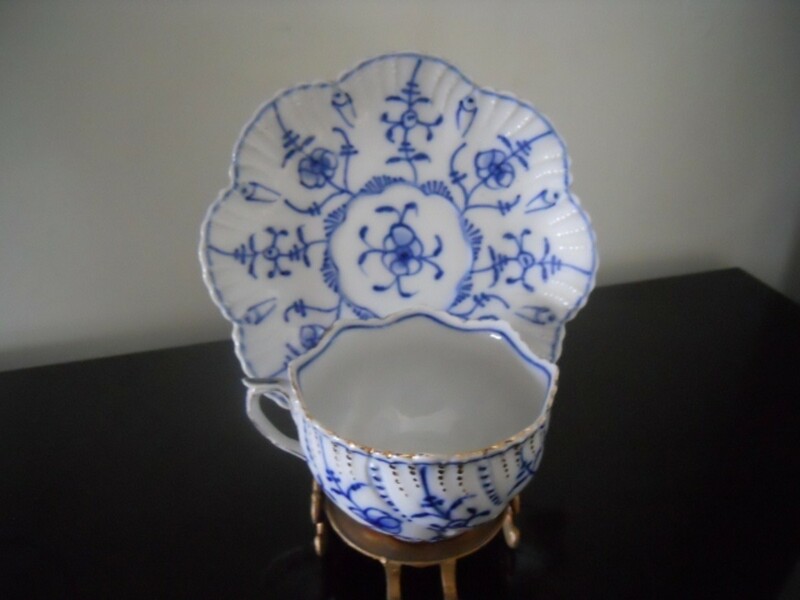 What a really cool page about your Vintage Porcelain Collection. Beautiful pieces and very informative lens. Nice job! My mother has some beautiful porcelain pieces but I live in a small modern flat so can't have any at the moment. Congratulations on LOTD! Beautiful pieces!! Congrats on LOTD! I found this so interesting. I have a set of Dresden packed away that I inherited and never knew too much about--seems it is worth looking into! Thanks and blessed :&gt;) Congratulations on LotD! Great photos and info. Congratulations on Lend of the Day! I would love to own a porcelain collection. 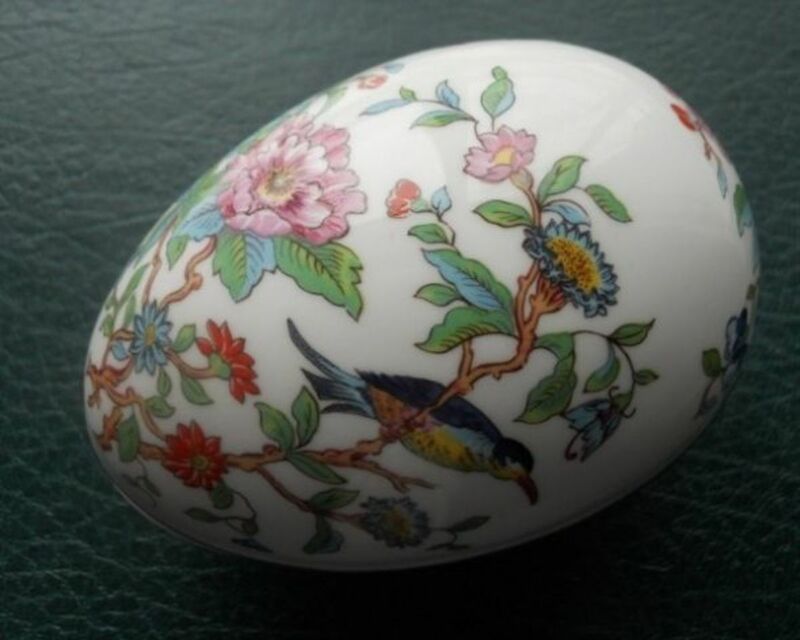 I especially love the porcelain egg....so beautiful! I'm still kept my grandfather antique. He has a few porcelain. Congrats on the LOTD. Just love this collection especially the Bavarian ones. Such beautiful porcelain collection. The Nippon Porcelain are outstanding. Wow! That's quite a collection! Gorgeous China. I am a huge porcelain fan. It is all I buy. Bone is the best but porcelain is next and can withstand a lot. We use it in our restaurant as well. Great stuff! I love the vintage pieces and have started collecting a few years ago. We started collecting Wade English porcelain several years ago, beginning with the small Red Rose and Whimsie tea animals. But Wade makes so, so much more, and they've got wonderful pieces that still look great from the 30s and 40s. They did some wonderful work in the early 1950s with great detail and painting. For a number of years they operated a factory in Ireland as well and they made some charming Irish character pieces with very distinctive coloring. They also did great work with marks. You can pinpoint manufacturing point, which subsidiary did the design, and down to a specific year or two with many marks. Thanks for covering the issue of porcelain marks. It's an important part of dating original pieces. Porcelain become valuable with time due to its fragility. Dolly Madison notwithstanding, when a piece is dropped, the limited edition shrinks and the price of everyone else's goes up.